With a new year comes excitement as to what it may bring and what we could do to better ourselves, and our surrounding environment, where possible. I was looking forward to my first workshop in 2019 and was very thankful to have been greeted by such a lovely group of little people hugging me and asking me where I’d got to. If I hadn’t been having the best day, this would have made everything so much better. 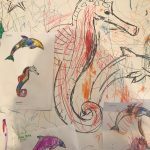 We were thinking about ocean conservation in this weeks’ workshop so after having a chat about sea life and how we can look after it better with this engaging nursery class, the little people and I began sketching and colouring in dolphins and seahorses. Relaying that dolphins have the same level of social intelligence as a three-year-old child caused sheer amazement and created lots of follow on questions – which was excellent – as did how male seahorses carry their babies, not the females. The children were slightly perplexed by this idea but, eventually, were happy to accept it as fact as sometimes we all must do. 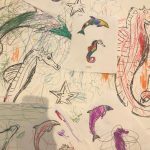 Towards the end of the workshop I asked the children why these sea animals are endangered when one little girl piped up with a big grin on her face, and began listing the names of other endangered animals we’d covered in previous workshops. It was so good to realise that she’d been taking it all in and clearly enjoying the process of learning about conservation in its many forms. What a great way to start my workshops for the year, so thank you for having me Nursery.